Linkage analysis has aided in the identification of genes involved in many diseases, including several cancers. It relies on using family-based data to detect genetic loci that may harbor disease predisposing genes. Although linkage studies were first designed to find the genes responsible for simple Mendelian diseases (diseases caused by alterations in a single gene), today it is more common for investigators to use linkage analysis to locate genes involved in complex diseases (diseases caused by the independent and joint effects of multiple genes often in conjunction with environmental factors), such as pancreatic cancer. During the past decade linkage analysis has been key step in the identification of several cancer genes, including BRCA2 and STK11, which additional studies have shown also carry an increased risk of pancreatic cancer. However, these known genes explain very little of the observed familial aggregation of pancreatic cancer. While the foundations of linkage analysis are relatively straightforward, the actual implementation of linkage studies, especially for complex diseases such as pancreatic cancer, can be quite difficult. 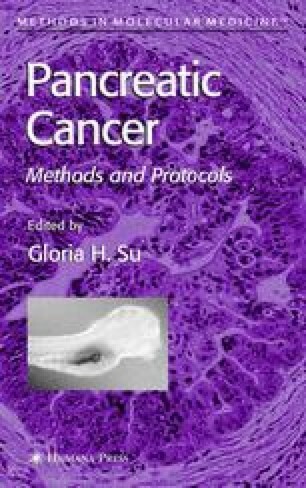 This chapter focuses on the basics of linkage analysis for qualitative traits (affected/unaffected) as could be applied to the study of pancreatic cancer.